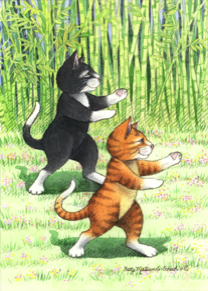 They are two comical & curious Kittehs sharing their worldly travels & wild adventures. 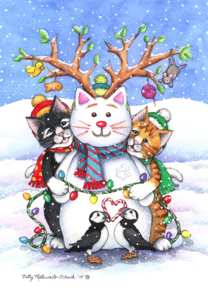 They're here to bring joy & good wishes to family & friends on this site through greeting cards, mugs, T-shirts & a variety of whimsical Kitteh merchandise. Where ever they go, they leave a tiny 'PAW PRINT' in each of their adventures, so look for their 'mark' on each product. 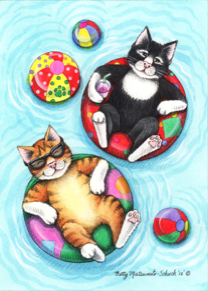 Feel free to browse & click 0n links to a variety of whimsical Kitteh cards & products for sale at select websites. 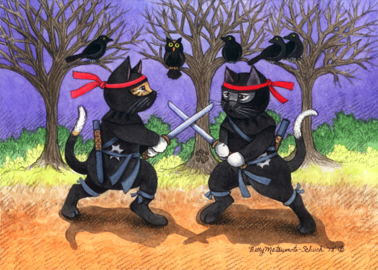 Bud & Tony were created from the likes & namesake of my two domestic shorthair Kittehs. Teaming with outrageous personalities & waggish behavior, they became the whimsical illustrative characters which you see here. Their reputation for colorful antics, witty banter & verse are all part of their desire to send joyful, placating messages to everyone. Be joyful, be sincere, be kind.